At its simplest, your website has a certain number of pages. How many of those pages contribute value to your site visitor? When making big changes, you have the chance to better focus your website, potentially dramatically reducing the size of your site. Depending on how deeply you will be modifying the content, you also will need to spend some time handling content during a migration. If that is the case, then the more content you have then the more effort you will expend on your website changes. Really the weight of your site is more than page counts, and includes other areas of complexity like the number of backend systems you integrate with. As with content counts, these other aspects are a weight that you may need to transform or recreate when changing your website. The amount of change needs to be carefully considered when planning big improvements to your site. Remember the point here is the distance from where you are now to where you want to go. In other words, this is not on some absolute scale but relative to your starting point (what you have right now). If you already have a large technical team implementing cutting edge functionality, then going even further may not be a stretch. But if your team is currently having a hard time keeping up with weekly content updates, then adding some even simple collaboration for external users may be unsustainable. Where possible, attempt to minimize both distance and weight. In this example, you are starting with a heavy (complex) site, and are also trying to make big changes to that already-complicated site. Ideally you want to try to keep your efforts down as far in the lower left of the graph as possible. Sometimes you just can't do that, but in general the goal should be moving to a simpler site and not trying to change everything at once. 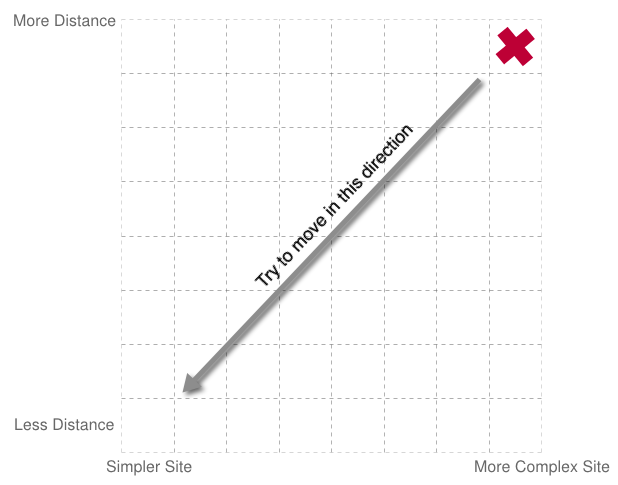 Use this tool to start seeing where you are on the complexity / distance graph. Usually organizations end up backing into a certain quality level, and what this often means is that the quality suffers. I often frequently been in conversations where the technical team says something black and white about what is possible from a quality perspective, when in fact the content owners just need to understand the trade-offs in deciding upon quality levels. But there are always tradeoffs in quality. The biggest problem occurs when no one even talks about quality expectations, and only when people see the resulting site do they realize the mismatch in expectations. The first step is to simply consider weight, distance, and quality. The next is to tweak each of these in order to come up with a manageable plan. One effective way to control these knobs is in phasing, where you start by implementing the aspects that most move you toward your vision. For example, you may start by using your current taxonomy, and then over time make it more nuanced. An advantage of phasing to control the distance is that you are then preparing everyone for ongoing quality changes to your site (immediately everyone is thinking in terms of phases). Note that all the knobs are related. For example, reducing the weight means that you have more time to make the remaining quality high quality. Similarly, if you decide on higher quality then that may drive you to attempt to make fewer changes (distance) to the site.